At Adelady, we like people who help others, so we’re pretty fond of our friends Splash Adelaide! They want to help YOU hold a kick-arse event this summer. They support Adelaide business owners, entrepreneurs and visionaries to lead events, projects and activations that help to make Adelaide EVEN more exciting. So, if you have a fab idea – bloody get off your fine bum and apply! 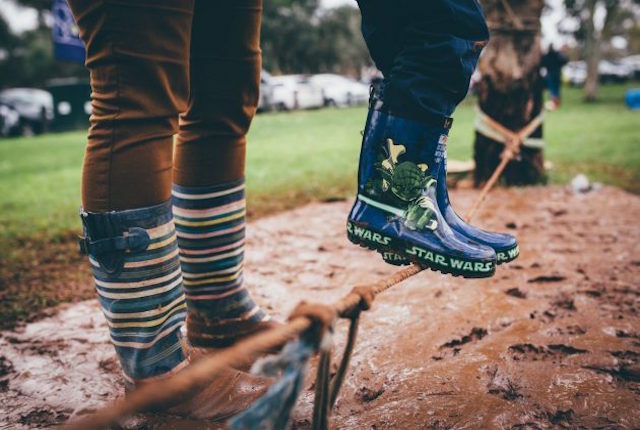 The Adeladies behind Outdoor Playgroup Adelaide came up with a bright idea to hold a cheap, kid-friendly and super fun event in Adelaide – SQUELCH! For children aged 2 to 6, the Mud Run and Adventure Challenge will feature 12+ obstacles that are challenging but also very safe! It’s an opportunity for your kids to take risks, challenge themselves and bond with other kids in a safe, healthy and active environment. The kids get to crawl, slide, climb, run, jump, balance, swing, dodge and squelch through mud! And, Mums and Dads get to accompany their messy child through the course at no extra cost. Splash Adelaide came on board and helped them get it up and running. Nek minute – the event is SOLD OUT! So – do what they did, create the event you’ve always wanted to. Think summer night markets, foodie trails, music festivals, art explosions… anything is possible! Squelch is supported by Splash Adelaide — an Adelaide City Council project bringing the City’s streets and spaces to life through a series of community initiated and run urban experiments. Previous PostWIN tickets to Winter Food and Wine Festival + a ‘Meet the Maker’ masterclass! Next PostGoing into labour at 30 weeks!